The first satellite of Europe’s Copernicus programme was sent aloft today, Thursday 3 April, by a Soyuz launcher from the Guiana Space Centre as scheduled at 18:02 local time (23:02 CET). 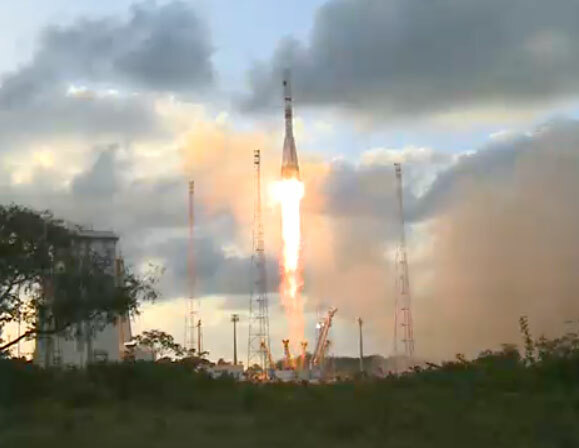 Soyuz launcher lifted off on 3 April 2014 from the Guiana Space Centre at 23h02 (CET) with Sentinel-1A satellite on board. Credits: ESA/CNES/Arianespace/Optique vidéo du CSG. Sentinel-1A will deliver day/night, all-weather Earth imagery. It will be joined in early 2016 by a 2nd satellite, Sentinel-1B, to form a constellation capable of scanning the entire surface of the globe every 6 days. Initiated in 2005, Copernicus (formerly GMES) is a vast global environmental monitoring programme led by the European Union and developed in partnership with ESA and member states. The space component of Copernicus will rely on a constellation of Sentinel satellites as well as French satellites—Pleiades, SPOT, Jason-2 and Megha-Tropiques—operated by CNES. The Sentinel-1A satellite will supply radar imagery of Earth’s surface. Credits: ESA/P. Carril. Copernicus will deliver a suite of information services vital to monitor and manage our planet. The project marks a radically new approach to environmental issues, the study of the effects of climate change and actions engaged to protect human lives. In addition to its Earth-observation satellites, CNES is playing an active role in the Copernicus programme at Europe’s launch base in French Guiana from where the Sentinel satellites are being orbited. 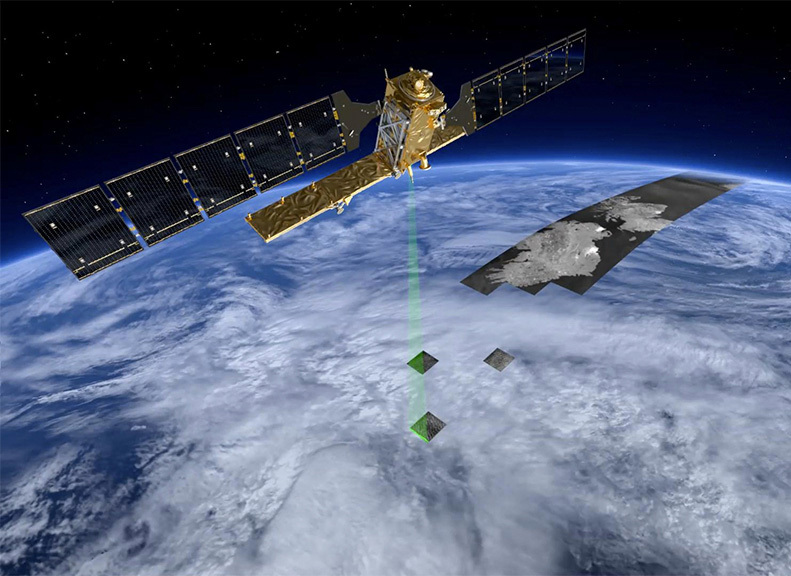 On Sentinel-2A and Sentinel-2B, CNES is also providing ESA with technical support and expertise in image quality (simulation and algorithms) and operations planning. On Sentinel-3A and Sentinel-3B, it is providing ESA with technical support and expertise in radar altimetry. CNES is also supplying the satellites’ two DORIS precise-positioning instruments. Sentinel-1: day/night, all-weather radar imagery of Earth’s land surfaces and oceans. Sentinel-1A launched 3 April 2014. Sentinel-1B to launch early 2016. Sentinel-2: high-resolution optical imagery of land surfaces (soil cover, vegetation, coastal zones, inland waterways, etc.). Sentinel-2A to launch 2nd quarter of 2015. Sentinel-3: optical imagery of global ocean and land surfaces. Sentinel-3A to launch 3rd quarter of 2015. Sentinel-4: payload to be carried on a Meteosat third-generation satellite (MTG-S) to acquire data on the composition of Earth’s atmosphere. To launch in 2021. Sentinel-5: payload to be carried on a second-generation satellite (EPS-SG) to acquire data on the composition of Earth’s atmosphere. To launch in 2021.